This is the complete city tour of Buenos Aires. It will introduce you to the city and make you feel the essence of each historical and popular place and neighborhood. By using public transport (bus and subway), you will be a part of this amazing metropolis, having a unique and real, daily life experience. Historical buildings, monuments and streets will show the transformations and progressions of the city. Tango, football and immigration influence have made it one of the most irresistible cities in the world. Please note: there will be a 30 minute stop for lunch at your own expense during the tour. 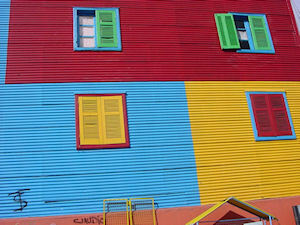 Sights you will see during this tour include: downtown, the obelisk, Casa Rosada, Cathedral, Cabildo, San Telmo old barrio, Caminito in la Boca, recoleta and the Cemetery with the evitas Famous Grave. Please note: You will have time to explore on your own, the guide will assist you in getting a taxi back to the port when you are ready. Remember to bring your camera. This is a walking tour that also utilizes the public transportation with the guide. Please note: You will have time to explore on your own, the guide will assist you in getting a taxi back to the port when you are ready. The cost of the taxi is approximately $ 8 for the 10 minute drive back to the ship pier.